WWW.WAFFEN-SS.NO "17. SS-Panzergrenadier-Division Götz von Berlichingen"
10/1943: 17.SS-Panzer-Grenadier-Division "Götz von Berlichingen"
Surrendered to the Americans in May, 1945. The history of the 17. SS-Panzergrenadier-Division "Götz von Berlichingen"
The division was raised on 3 October 1943 in the response to the demand from Adolf Hitler's headquarters for a new formation that was to bear the name of the German knight Götz von Berlichingen. This new unit was to be an entirely new formation and recruiting difficulties were to delay its forming until December of 1943. Götz (or Gottfried) von Berlichingen was a German knight who lived between 1480 and 1562. Born at the castle of Jagsthausen, he waged many wars and carried on numerous feuds - mainly for ransom and booty. While assisting Albert IV, Duke of Bavaria, in the siege of Landshut in 1505, his right hand wa shot away. 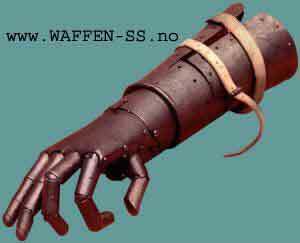 The iron hand he then adopted allowed him to continue fighting, gave him the nickname of "Götz of the Iron Hand" and the SS division that was to bear his name almost four centuries after his death, a symbol. The divisional elements were to be built up in western France during November 1943, and a formation staff (Aufstellungsstab) was set up under SS-Obersturmbannführer Otto Binge, provisionally based at Poitiers, under the LXXXth Army Corps, 1st Army, Army Group "D". This was to remain the new Division's higher formation until late April 1944, when it came under the Ist SS Armored Corps. On 24 November, one of the Division's most noteworthy units were reaised. This was the armored reconnaissance battalion (SS-Panzer-Aufklärungs-Abteilung 17), which was based upon the 15th (motor-cycle) companies of the "Frundsberg" Division's two infantry regiments and formed at Thouars. Two days later on 26 November 1943, the 40 year-old Werner Ostendorff was chosen to command "G.v.B." Before being given command of "G.v.B. ", he had been on the staff of the SS Armoured Corps and was its chief of staff at Kharkov and during the Kursk and Mius offensives. Ostendorff was appointed on 26 November 1943, but did not assume effective command of "G.v.B." until January 1944 as a result of delays in raising the Division. Supply for the divisional elements was slow and with only three quarters of the required transport at hand, the Division began a collection of French vehicles on the orders of the LXXXth Army Corps. In this way, "G.v.B." was at least partially motorized by March 1944.